Spore Release – September 5/7 – World Watching Wright | Fruit for Thought! 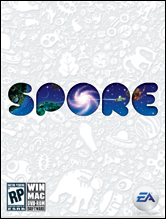 I probably haven’t been looking forward to Spore as much as it might deserve. I feel it’s more of a 4,5,6 or 20 in 1 game, rather than a new direction for PC gaming. Of course that depends on how well each level is integrated. Hopefully it won’t end up as some sort of glorified all-in-one WiiPlay.